Here’s a brief history of the Robinhood Free Meetinghouse. The Meetinghouse is a regionally rare example of a two story meetinghouse and the structure is eligible for the National Register of Historic Places. Robinhood Cove is one of several clustered population areas that compromise Georgetown. Situated on the Sheepscot River, this geographical area is critical to the development of Georgetown. Robinhood Cove was named after Robert (Robin) Hood, which was the English name given to Chief Mowhatawoemit, the leader of the Abenaki Confederacy. The Cove was a significant economic force in 19th century commerce for trade and shipbuilding for Georgetown/Arrowsic. Benjamin Riggs settled Riggsville on the eve of the Revolution and during the last decades of the century had prospered in his mercantile pursuits, and he built a number of storehouses and a large general store in 1820 to house his merchandise and thriving business. He was also a shipbuilder and an active public servant (Maine Legislature and Massachusetts General Court). His house, the Benjamin Riggs house, was the first structure in the Riggsville/Robinhood collection. Moses Riggs took over operation of the Riggs family concern on his father’s death and ran it from 1846 to 1884 when it passed to his son Kervin. He was a driving force in the expansion of Riggsville’s economic power. Moses Riggs was in his first decade of leading the Riggs family business and with other civic leaders sought to build a new, grand meetinghouse to replace the community’s first meetinghouse, which it had outgrown (Moses owned, and sold, that first meetinghouse on its replacement with the new structure). The new Meetinghouse was built in a central location on a hill at the junction of roads leading to prominent homes (Webber Road, Robinhood Road, and Old Country Mile Road. At the time of its construction, Riggsville was on the ascendant, and the Robinhood Free Meetinghouse was an expensive, public expression of the community’s economic success and the aspirations and devoutness of its residents. The community’s pooling of resources to build this central feature of their communal life was a significant milestone and illustrative of decision making in the community. The Moses Riggs house (ca 1850), moved from original location to nearby knubble in mid-1900s. At the request of Moses Riggs, the leading town businessman of his era, and other applicants, a public meeting was called by Washington Gilbert, Justice of the Peace for Sagadahoc County and held on September 6, 1855 at 1:00 PM, at the Georgetown school by to act on the business of erecting a meeting house. Notice was posted at the school and at the Samson and Riggs store in Riggsville. At the meeting, Riggs, Jacob Power, and William Crosby were named to the building committee, “the Proprietors of the Free Meetinghouse.” The Meetinghouse was to be shared by Methodist and Congregationalist congregations. Specifications for the structure were 36 feet wide by 46 feet long, with 23 foot posts; the basement (ground floor) to be occupied by a vestry or schoolroom (for the congregation). Some historical accounts indicate construction of the Meetinghouse being under way in 1855 or even completed by local craftsmen using traditional tools and practices. July 12, 1856 – The building is accepted in performance of contract. The cost of the building was $2,600.00. Local history has it that Moses Riggs got cooperation from workmen on a promise of a tot of rum for each working day, while others indicate cider was the inducement to productivity. This was an extremely common practice at the time in the area with shipbuilders that was in conflict with the church’s temperance practices. September 20, 1856 – the land on which the Meetinghouse stands is conveyed by deed to The Proprietors of the Free Meetinghouse, by two Georgetown-based sea captains, Francis Low Jr. Warren (Joseph Warren in G.V.R.) And Herbert Low and their wives, Margery and Margaret. Shares in the meetinghouse were sold with 40 pews being available and shares valued at $60.00, to be sold in full or half shares. A schism occurs within a few years, and by 1864, the Methodist Society appears to be in sole possession of Meeting House. In addition to religious services, Meetinghouse was used as a religious school. After the Civil War, Maine experienced population loss across the state, primarily young men. Georgetown lost 29% of its population between the 1860 and 1890 census (see Appendix.) The congregation declined noticeably, but the town elders who built the Meetinghouse continued to support the church into the 1890’s. By the 1880s, the society is diminished due to death and out-migration. Georgetown continued to decline precipitously in population until WW2 but use of the Meetinghouse as a place of meeting for religious purposes continued into the 1960s with some itinerant use into the 1980s. For at least a decade, beginning in the late 1870’s or early 1880’s, the Meetinghouse was used as the first free and only, public high school in Georgetown. 1924 – Agnes Power takes vows as Lay Preacher of the Methodist Church and holds position to 1964. 1961 – Electric power installed and dedicated in August 1961. 1994 – Meetinghouse transferred to private ownership and restoration undertaken by Robert “Pat” Burns and Elizabeth Spaulding. Restoration preserves historic character of building, retaining interior features and exterior features, while adding a full service kitchen. 1995 – 2011 – Robinhood Free Meetinghouse operates as a restaurant. Chef Michael Gagne purchased the property from Burns & Spaulding in 2001and operated the “Robinhood Free Meetinghouse” as a nationally known French restaurant. The Meetinghouse employs a generation of islanders and ultimately launches Gagne Foods, maker of “Robinhood Meetinghouse” brand frozen backed goods, whose production facility is in nearby Bath, Maine. 2010 – Sagadahoc Preservation, Inc., awards the Robinhood Free Meetinghouse a Commercial Building Award, for stewardship of “a Maine destination and a reminder of our architectural history. 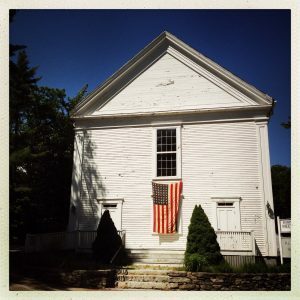 2015 – The Meetinghouse is purchased by Robinhood Ventures, LTD with the purpose of preserving the building and operating an event venue capitalizing on its intact historic fabric and excellent acoustics. Gene Reynolds, Images of America: Georgetown, Arcadia Publishing, 2014. National Register of Historic Places Registration Form, Riggs-Zorach House, Nov, 1988. Gene Reynolds, Oral History, February 2016. Georgetown Tide, Volume 14, Number 5, Jan/Feb 1989. Agnes Powers, History of the Free Meeting House at Robinhood is Given at Services Sunday, The Bath Independent, August 31, 1961. Winthrop Weston Riggs (2nd), “Our Family”, September 1, 1953. Georgetown Tide, Volume 14, No. 5, Jan/Feb 1989. Georgetown Tide, Volume 3, Number 3, Sep/Oct 1987. Stephen Allen & W.H. Pilsbury, History of Methodism in Maine, Press of Ohaelbs E, Nash, August, ME 1887. The SPI Newsletter, Sagadahoc Preservation, Inc., Fall 2010. Tuesday Open Music Jam also features suppah and snacks! Food, music and no cover!